This past June, the Composites Innovation Centre (CIC), represented by our FibreCITY team, attended the JEC Americas Composites Show and Conference in Houston, Texas. 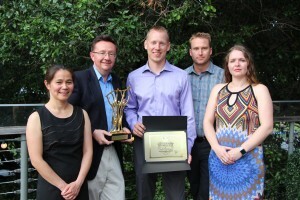 The team showcased the CIC’s innovative composite and biocomposite technologies, created connections and learned about other technology developments and opportunities in the natural fibre industry. 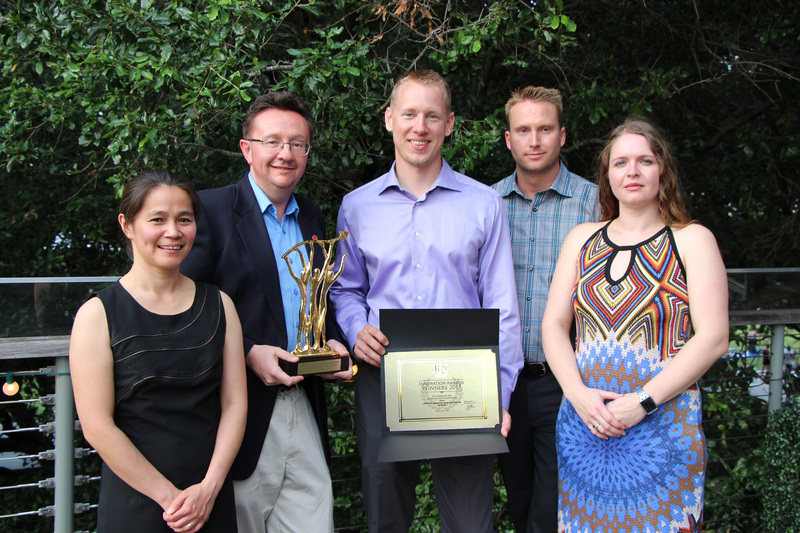 The CIC was also awarded the 2015 Innovation Award in the Biocomposites category for the team’s work with the FibreCITY initiative. The Innovation Award Program is a long-standing program that began in 1998 as a way to recognize excellence in composite innovations. Other participants at the conference included key players from all over the world such as Europe, USA, and Asia. This was an opportunity to grow the CIC’s, and FibreCITY’s, reputation as a hub for the latest technologies in composites and an organization that is continually growing its capabilities. New Flyer Industries Inc. approached our CIC team to prototype a roof hatch for their 60-foot battery-electric/fuel cell Xcelsior® bus from their Zero-Emission product line. This new electric drive bus uses a combination of batteries, a fuel cell and hydrogen storage to provide continuous electrical power with a regenerative capability. The added roof-mounted electrical equipment meant raising the roof line to create additional space. The roof hatch tunnel provides a passageway from the interior to the exterior of the bus with full isolation from the electrical components and ventilates the passenger compartment. Working with New Flyer, our prototyping team created a functioning prototype tool and part to verify the design functionality, part rigidity and material selection for manufacturing purposes, without the high costs of production tooling. This project began with New Flyer defining part geometry and part thickness details with a CAD model and part drawing. We used Siemens NX CAD software to transform the New Flyer CAD model into a wood, fibreglass and tooling paste prototype design. 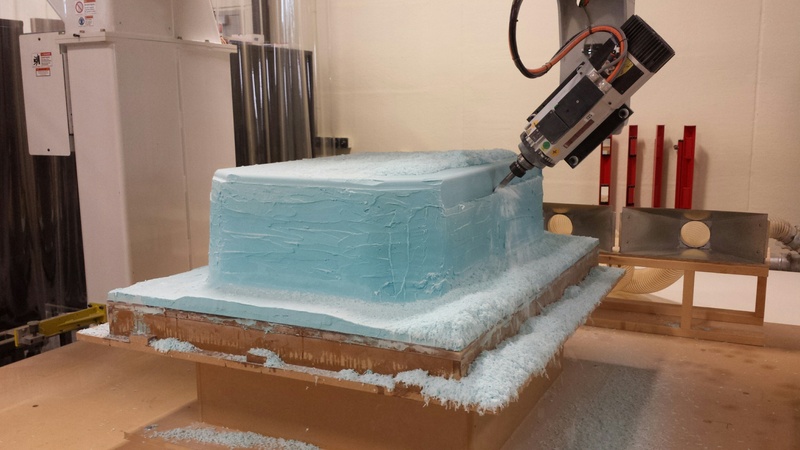 A lightweight crating structure with a tough fibreglass skin was used to support the extruded tooling paste to allow the direct-to-tool pattern to survive several fabrication cycles. 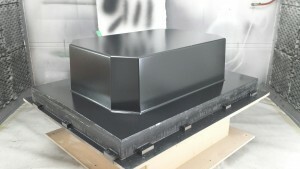 The tooling paste was machined to near net geometry and then sprayed with a high-build primer. 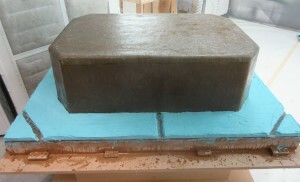 After many hours of sanding and polishing, a sealer and release were applied and the mould was complete. We then fabricated the prototype roof hatch part using an open-mould manufacturing method, laminating a fibreglass mat and a shaped foam core to the mould in stages. 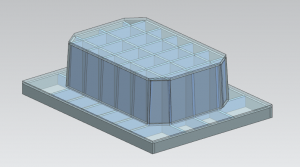 The prototype mould and part was provided to New Flyer, ready to make more parts or production moulds as required. Our prototyping team will be consulting with New Flyer to suggest manufacturing recommendations as they transition from the prototyping phase to the production phase of the project.